Anyonw know how to make the pictures all line up? Does anyone read this? I'm thinking no. But this is a good way to vent frustrations. I know some html so I was messing with that but t'ain't working yet. I am using ivory buttons. I'll post a finished pic when I get the buttons on and the pockets stitched down. Pattern Description: From the Butterick envelope: MISSESâ€™ COAT: Lined, fitted coat in various lengths, has raised waistline with back princess seams and pleat, front button closing. A, C, D, E: side seam pockets. A, D, E: back tab. C, D, E: optional snaps at lower front opening. E: sleeve tabs.I made version B. Pattern Sizing: This is 8-10-12-14. I made a straight 8 with no alterations except an SBA. More on that later.Did it look like the photo/drawing on the pattern envelope once you were done sewing with it?Yes, except mine is very poop-brown colored. Were the instructions easy to follow? Yes and no. The instructions for the outer layer was great but the lining instructions were horrible. 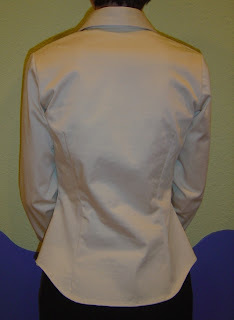 At one point they tell you to stitch the sleeve lining together and slipstitch the sleeve lining to the bodice lining. Are they kidding? Oh, and you are supposed to ease the sleeves at the same time you are slipstitching them on. I have no idea why they don't have you just machine sew them on. I did the lining my own way. I used the Threads tutorial and the bagging tutorials on the fashion-incubator site. Tutorial #1 and Tutorial #2. What did you particularly like or dislike about the pattern? I like the lines of this pattern. I love the pleat at the back. Here is a back view. Fabric Used: This is a wool that my friend brought when they were cleaning out their house. Thanks Mark!!! It is my muslin. I plan to buy a nice wool flannel for my "real" coat. In the pictures it looks like a bad brown but in reality it is this color. More pink than brown. I lined it with a burgandy lining I had already. I didn't have enough for the whole thing so I used a black lining for the arms. Here is the whole thing. You can tell I didn't do the lining right because there should be more of the wool folded up. I realized after I was done that the lining needed to be shorter. Oops. In the real directions, you do some weird thing where you handstitch it up. I'll know better for my real version. Pattern Alterations or any design changes you made: I did an SBA. I folded most of the dart out. I left behind some of the dart mostly for the design element. I like the line there. I changed how I lined it. In the picture above, you can see where I pulled the whole jacket through the underarm seam. Next time I'll use a longer seam because the seam is so small I popped a few stitches pulling the coat through. I am also debating putting a belt on it where the bodice meets the bottom. It just seems a little jarring, especially in back. I may also just add the little accent piece from the other views. I will handsew the pocket flaps down so they don't stick up so much. I think buttons will help the overall poop-brown blah. Would you sew it again? Would you recommend it to others?Yup. I recommend it to anyone who wants a basic coat pattern. Conclusion: Cute coat. Basic and easy to modify. Take better care of myself during the two on. Can't be an effective parent/person without this. No more "no dinner" for me. Take better care of my children during the two on. Buy fabric wisely. Stop just buying the Bold and Beautiful. Buy some sensible fabric too. Stop buying patterns that I don't use. Get TNT patterns for all the basics. (Work Pants: check, t-shirt: check, skirt: not yet, suit jacket or some dressier top: nope, A Couple of Fun Casual Tops: not yet.) Sop I have a bit to work on. I'm on my two off . . . I wanted to be like all the cool kids out there and post pictures of my sewing addiction. So, here I am. First pattern on my blog. WOOT! Pattern Description: Semi-fitted shirt with separate or integrated collar band. Long sleeve with choice of barrel or French cuff. Shaped by darts at bust and waist for a fitted appearance. Pattern Sizing:I made size P (bust 31") with the hip size of S. Next time, I'll do this a little differently. See alterations below. If you are not familiar with Jalie patterns, they have all sizes from bust 22 3/4" to 50". Did it look like the photo/drawing on the pattern envelope once you were done sewing with it?Yes, it is great. I did the french cuffs and collar with collar stand.Were the instructions easy to follow?They were very easy to read/understand. I have made several shirts in the past and have always strugggled with the collar. This one was easy and looked great. What did you particularly like or dislike about the pattern?Love the variety of sizing and the clean, simple lines of this pattern. I like that they give you choices of cuffs and collars. Fabric Used:This is a cottom stretch sateen bottom weight. It is a little thick for this shirt but it actually looks and feels great. It had a slight sheen to the fabric and it really pretty. I will make more of these in this fabric.Pattern Alterations or any design changes you made:I flared out the waist to make it an S you can tell from the back that I flared a little too much. Next time I'll flare using the Q or R as a guide. The P size is technically a kid size and the length of the shirt and sleeves were "kid length" so I extended those too. Stupid me, on the arms, I just chopped the arm and lengthened. The cuff is really tight. Next time, I'll lengthen and use a different size for the wrist. Maybe an R?Would you sew it again? Would you recommend it to others?This is a workhorse top. Perfect for work, easy to make, clean and neutral. You could jazz it up with buttons or embroidery or just leave it neutral. I wanted something that would go with anything so I chose neutral buttons. Here it is with a wool crepe skirt I reviewed here. Next time I will decrease the size of the french cuffs too. They are cute but really long. Conclusion:Love this shirt. Perfect for work. This is a great wardrobe basic pattern. This skirt is a Wool Crepe from Gorgeous Fabrics.